This sweater is a fussy bugger. It's supposed to be a sleeved poncho, which I know I'll appreciate on lazy weekends with cuffed jeans or jeggings, but it is otherwise a big ol' tent. I thought I'd try belting it to give it some shape, but this is effective only as long as I don't move my arms - it reveals its poncho-ness (ponchitude?) with those gaping sides. I do like the scalloped effect that results, but it sure does like to ride up more often than not. Since I love to pair green with grey, I thought this top would work well with my funky zipper back pencil skirt - last worn with green as well! (I didn't capture a picture of the back of this outfit because my backside is not my best side of the fussy riding-up-issue aforementioned.) 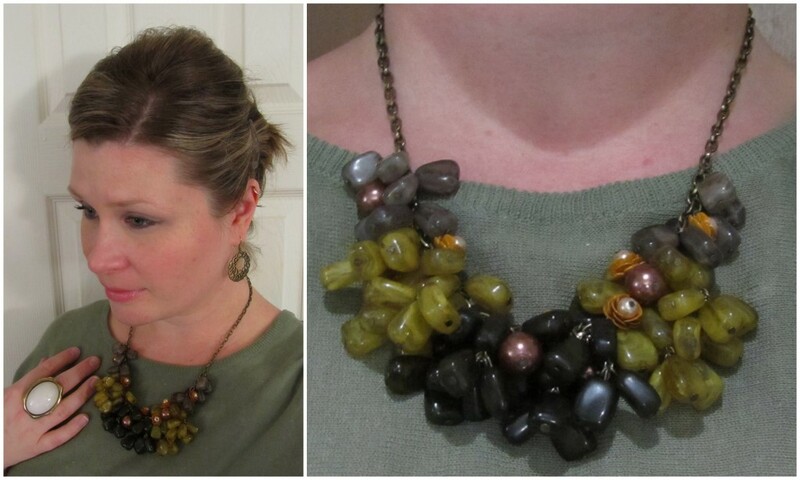 Needing more accessorizing especially at the neckline, I added this new clustered necklace of mine. It's definitely one of those that doesn't "match" but "goes" - the color palette works with the colors in the outfit overall, and it has just the right amount of bulk that it balances out the volume of the top. In other, but related, news, I need to experiment with other indoor photo locations in the new place. This narrow white door is quickly becoming a bore, and it's not even winter yet! nice and lovely as usual - may I ask a personal question - trust me I am not a pervert... really !! What kind of undergarments to you wear...brand? I am looking for the same "shape"
totally fair question! i'm a huge fan of lane Bryant bras - the balconette and new plunge are my all time favorites, and they're always at least buy 1 get one half off. (twice a year they're buy 2 get 2 free!). i'm also an even bigger fan of spanx!